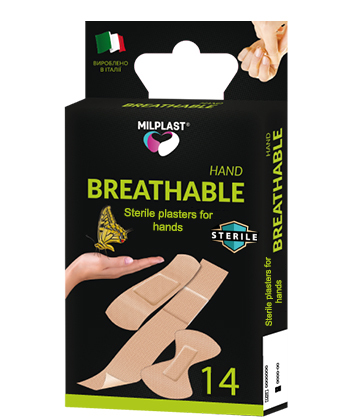 Milplast Breathable Hand plasters are specially developed for reliable protection of damaged hand and finger skin areas. We recommend to apply these plasters for small abrasions, cuts and calluses. The plaster elasticity allows its application on any skin area, while its body color ensures its maximum blending into the skin. In addition, packages include butterfly-shaped plasters, ensuring reliable fastening on finger bends. Milplast Breathable Hand can be removed easily and painlessly, without remains on the skin.